Ayesha and Zachary are attemping to do something pretty cool here. 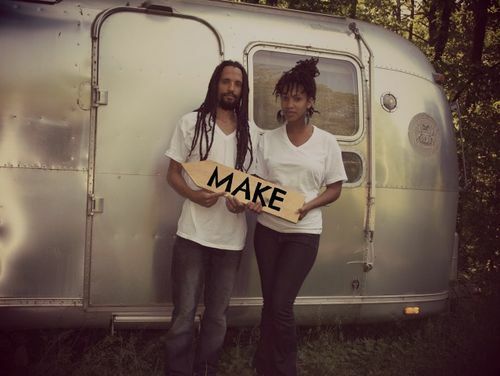 They want to turn their 1975 Airstream Sovereign into a mobile MAKE studio that travels around the Southeast, allowing participants to make something with their very own hands for free. "Art and the ability to make something is highly divided among income lines. We live in Chattanooga, TN where the arts are highly regarded and widely supported through grants, and different programs. But we were surprised to find out just how many people had never taken an art class, or made anything using their own hands. We are here to remedy that through a program that takes the art to the people who need it most." They've entered a contest called The Power to Change, and a chance to win $30,000 toward their project. You can read more about them here, and you can vote for them here.